What is needed to make a forest practices act work? Appendix 1. Evolution of Oregon's forest practice rules, 1972-1993. Describes brief history and origin of Oregon's Forest Practice Act (FPA). Lists reasons for increasing forest regulation. Explains concepts of feasibility for the FPA as technical, economic, and institutional. Rule-making processes and players are shown to have changed from 1972 to 1994. Enforcement processes are reviewed. Seven responses are presented to the question of "What is needed to make a Forest Practices Act work?". Motivation issues are also raised. The Oregon Forest Practice Act of 1971 (effective 1972) had its origins in progressive forestry legislation in Oregon dating back before 1941. The Forest Conservation Act of 1941 was enacted to require reforestation of logged lands through a variety of options with fees collected from those who did not follow the law to cover state expenses of reforestation. In response to social activism and concerns of publics about impacts of forest practices beyond reforestation, leaders of the forestry sector (private and public) began to develop the Nation's first comprehensive forest practices act in the late 1960's. The Oregon Forest Practices Act of 1971 covered most forest operations and provided protection for soil, air, water, fish, wildlife as well as forest resources. The Forest Practices Act (FPA) provided for field inspections with authority to shut an operation down for violations and with financial recourse in the form of penalties and property liens for corrective actions. The forest industry was a major supporter of the FPA and saw it as a way to control the "few bad actors" in the forestry sector. The fundamental thrust of the FPA was on prevention of damages before they occurred through acceptable practices rather than punishing violators after the fact. While the punitive elements of the FPA were present, the major emphasis of the FPA was on pre-operation planning, education of operators, and cooperative efforts. The overall administration of the FPA was given to the Oregon Department of Forestry under the guidance of rules promulgated by the Board of Forestry. Three regional rules committees were established to deal with rules that were tuned to the ecological regions of the state: Northwest Oregon, Southwest Oregon, and Eastern Oregon. At the time, the Board of Forestry and the three regional committees were dominated by industry members generally expert in the operations covered by rule making. Funding for the FPA is 60% from the state's general fund and 40% from a harvest tax levied on landowners (the harvest tax is a broader tax that includes forestry research; public relations education; fire control; and other elements). The FPA has been amended formally four times to provide additional resource protection and numerous rules have changed almost annually within the administration of the FPA. For a more complete history of the FPA please read Appendix 1 on the evolution of Oregon's forest practice rules. My own career has been intertwined with the FPA, starting as a field forest engineer with Weyerhaeuser Company to my present position as Professor and Timber Harvesting Extension Specialist. I worked in the industry regulated by the FPA, and I have provided education to Forest Practice Officers to help them administer the FPA more effectively. Our Forest Engineering Department conducts research on key problems of forest operations and has educated many of the FPA staff specialists and some of the Forest Practices Foresters. I have served as an unofficial mediator in helping government and industry base forest practices rules on "good science". At one time, I reviewed all of the FPA citations from 1972 to 1992 to assess whether patterns were evident in the violations and enforcement activities. I provide testimony at regional committee rule deliberations and Board of Forestry meetings on FPA matters. I consider myself a scientist and technical expert without the explicit biases coming from owning or managing forest lands or having my state funding dependent on the enforcement agency. I do not consult in Oregon where a conflict of interest would arise with my University responsibilities. More recently, our Forestry Extension educational efforts have included public issues education for audiences to help them become more effective in their efforts to influence forest policies. The Oregon Forest Practices Act and other policy activities of state government are the arenas where we study forest policy actions and act as policy educators. My first experience with the FPA was in July of 1972 when the FPA had just become effective. Weyerhaeuser was building a wood stringer bridge across a Class 1 stream and my job was to make sure we disturbed the stream bank as little as possible and kept the machine activity out of the stream channel. We built the bridge using a crawler tractor and a log loader which minimized stream disturbance, yet allowed building a solid bridge to access timber at a good crossing location. One finishing touch to the bridge was to add a square timber to the top of the rail logs to serve as a guardrail. This required notching the top of the round log slightly with a chainsaw and using a broadaxe to chip out a flat surface to bolt the guardrail in place. The rail logs were clean, barked logs. The whole process produced 50 to 60 chips that fell from the bridge to the stream bank. Undoubtedly some fell in the stream and floated away. We received a FPA warning citation to immediately clean up logging debris entering a Class 1 stream. Apparently, a state fisheries biologist complained to the local Forest Practices Officer and the citation was sent to my boss. He picked up about a quarter pickup load of chips and brought them to work on Monday to show me how the FPA was to be enforced. We were both incredulous. This was a beginning to great misunderstanding of the role of large and small woody debris in forest streams within the FPA administration that continues today. Within the United States, fourteen states have forest practices acts but only six have comprehensive ones that support state enforcement, education of operators, monitoring, and complete administration of the act. Others call for using "best management practices" on a voluntary or required basis without the enforcement and education component. In other states, a variety of regulatory mechanisms and agencies are involved in regulating forest practices. · Greater public awareness - sometimes bad, non-forestry examples used to pressure regulators, e.g., mining, housing developments, etc. · Creation of myths (untruths treated as facts) by environmental groups, e.g., forest operations threaten water supplies. · Population shift to urban areas (new comers) that produce a growing population ignorant of resource industries. · Changes in composition of the Board of Forestry, e.g., requirement that publics be board majorities. · Desire of general population to secure a "Quick Fix" to complex social problems. · Change in respect for the forestry profession and the "silence" of the foresters (ineffective public communications). · Activist legislators seeking approval of environmental constituencies. · Visual access to forest operations through recreational access on forest roads. · Aggressive non-forestry agencies seeking to expand their regulatory involvement on forest lands. · Public panic/crisis reaction (aided by the media) to any environmental issue: for example, global warming. Most of these reasons continue strongly today in spite of the fact, that Oregon's State Forester, James Brown, stated recently, "We have come about as far as we can go imposing regulations on landowners," (OSU Forestry Extension meeting, August 10, 1994). It is useful to recognize three concepts of feasibility in regulation of forest operations through forest practices acts. The first element of feasibility is technical feasibility. Technical feasibility relates to physical and biological laws that must be understood before cause and effect relationships can be established with prescribed regulatory actions and desired future conditions. For example, a number of costly and ineffective forest practices requirements will do little to re-establish anadromous fisheries stocks if overfishing and ocean conditions are the primary causes for their decline. The logic of forest practices rules must be self-evident to those being regulated. Economic feasibility requires that the FPA regulations not be seen as oppressive to those being regulated. It is especially important not to unfairly impose economic consequences on certain classes of landowners, e.g., small landowners versus large corporations. The economic feasibility question is not easy to assess because environmental regulations do not impose costs along the classical lines of fixed and variable costs. I call them "lumpy costs" because they depend, not on the amount produced or on fixed charges prorated over production, but rather on the level of resource protection required. Figure 1 shows how progressive levels of Forest Practices regulations impact costs in a non-linear, "lumpy" fashion. 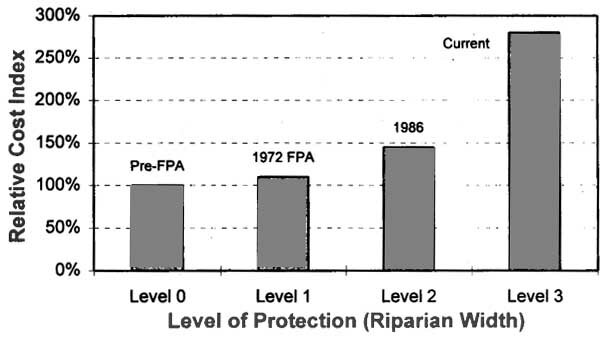 The ratio relates to increasing levels of resource protection measures associated with changes in forest practice rules for a hypothetical landowner. Figure 1. Lumpy cost structure of Forest Practices Act: Example cost impacts with changes. Institutional feasibility has at least two components: the first relates to the alignment of governmental and non-governmental institutions to produce changes in forest practices regulations, and the second relates to how the rules are enforced by government. An increasing number of institutions must be involved in rule-making processes, and indeed, these institutions often initiate rule-making activity on their own as further described below. The institutions affecting the enforcement of Oregon's Forest Practices Act are thankfully limited compared to some states where ten to thirteen institutional screens must be passed before timber harvesting occurs. Oregon's FPA requires consultation with the Oregon Department of Fish and. Wildlife but statutes limit other state agencies and other levels of city and county government from engaging in forest practices regulation (with some exceptions). Forest practices act enforcement also involves the institutions needed to conduct operations. No longer are they restricted to landowners, operators, and forest practices foresters but may involve consultants, public notification processes, hearings officers in pre-operation approvals and post-citation proceedings, and public watchdog groups organized to complain to the state about particular practices. Institutional feasibility may be considered the most significant feasibility concept for many planned forest operations. In the initial writing of the Oregon forest practices rules, the industry leadership was direct and evident through the established regional rules committees. Rather closed committees hammered out acceptable rules for consideration by the Board of Forestry. Oregon Department of Forestry and University research offered background information and rule suggestions from time to time. The composition of the Board of Forestry was primarily, technically oriented forest industry members and knowledgeable members representing public interests, e.g., labor, other state agencies, etc. A major change occurred with passage of HB 3396 in 1987 which changed the composition of the Board of Forestry and restructured how the rules would be written. The regional rules committees were reduced to advisory committees to respond to rules proposed by the Board of Forestry and drafted by the state forestry agency. The industry representation on the Board of Forestry was sharply reduced and public members were appointed by the Governor. From 1987 to present, legislative involvement in directing the actions of the Board of Forestry substantially increased. Activist legislators with environmental organisations as constituents have introduced substantial legislation to influence forest practices. Industry has fought to keep the technical rule making within the Board of Forestry and the advocacy legislation of activist legislators and other state agencies, e.g., Department of Environmental Quality, to a minimum. During each legislative session the battle rages fiercely in committee meetings and behind the scenes. Even when legislation is passed directing actions of the Board of Forestry, legislators testify before the Board of Forestry to clarify legislative meaning because their intentions were interpreted differently by forestry agency and Board members. Political considerations have replaced technical ones in rule-making to a large degree. Changes in the players of forest practices rule-making have occurred since about 1985. Professional foresters were the dominant rule-makers working for the state forestry agency, serving on industry committees, or serving directly on the Board of Forestry. The current composition of the Board of Forestry includes: two attorneys, a biologist zoo director, a forester (landowner/manager), a mill manager, a retired game officer (small woodland owner), and a state college president with the State Forester serving in an ex-officio position to the Board. Board members seem to have their own constituencies as they recommend rule directions or argue Board responsibilities. Some Board members even conduct their own "scientific" reviews and report back to the Board. Board members invite testimony at meetings and donate enough working hours for a quarter to half-time job (in the author's estimation). Forestry meetings resemble a trial held in front of the media. Witnesses are called or volunteer to testify and are questioned by the Board. Board members debate each other. The process is videotaped and tape recorded. Extraordinary skill is demanded of the Board Chair to keep the process and players moving forward. After passage of the FPA, Oregon Department of Forestry had to increase staffing of personnel to enforce Oregon's new rules. Initially, about 30-35 forest practice officers (not all were professional foresters) added forest practices enforcement to duties of fire protection, management of state forests, service forestry for small landowners, and other duties. Three staff people in headquarters guided the efforts. By 1994, nineteen staff people in the state capital along with fifty-four, full time forest practices foresters (all professionals but not all foresters) combine to administer Oregon's forest practices regulations. By the end of 1994, over 22,000 forest practices notifications are expected to be processed by the state forestry offices scattered throughout the state. Cost of forest practices enforcement including some special studies runs about $11.5 million per biennium and is expected to stabilize at about that level with only inflationary increases expected. Major disruptions of state government financing could come through political changes to reduce tax support of government functions. One measure to reduce the cost of state government has already been enacted but did not have a major reduction on forest practices enforcement. Throughout the history of the Oregon Forest Practices Act, there has been an effort to make enforcement a cooperative, educational undertaking as opposed to developing an adversarial relationship between regulators and those being regulated. In 1992, I reviewed all of the citations from 1972 for patterns of enforcement or trends. I found no patterns that could be described as discriminatory or punitive toward a firm or region. It was possible to see how in the early days of the FPA, there were many more violations for "failure to notify" for the operations. There were differences in the number of citations given to small landowners and small operators compared to large corporations with professional forestry expertise. Citations were more freely given before civil penalties (fines) were attached to them. Prior to civil penalties, firms might accept a citation they thought unfair and comply with the citation's corrective actions. After civil penalties, firms were more likely to contest citations as the fines multiply for repeat offenses. In review of the citations over a number of years for a large landowner (60,000 hectares), I found a few citations given that were not the landowner's fault, e.g., sedimentation from elk hunter vehicles; some were contrary to FPA intentions, e.g., citation given for maintaining a forest road (causing some minor sedimentation to avoid greater water quality problems) when FPA rules call for road maintenance; or some were citations the landowner accepted to practice better forestry, e.g., a reforestation failure held over beyond time limits so improved planting stock could be used rather than re-plant with less desirable stock. · Responding to "tattle-tale complaints" (repeated complaints for any forest activity) by disgruntled neighbors, environmental watchdogs, etc. · Nit-picking regulations (many regulations for unimportant reasons) such that every inspection results in a citation. · Enforcement efforts seeking to punish someone for "past sins". · Focusing on "paper" violations versus directing efforts at most damaging problems. · Using inspections and reviews as means to prevent or delay projects by imposing large costs and delays. · Being unresponsive to requests for information, clarification, and inspections. · Not recognizing cause and effect relationships in damage and rule infractions. · Singling out an operator or landowner for conspicuous enforcement, e.g., put the biggest operator in order. · Unreasonable ameliorative judgments for problems or damages. · Giving public right to sue for nonspecific damages, procedural approaches, etc. · Double standards for federal or state lands versus private operations, e.g., reclassifying regeneration failures as wildlife habitat. There is some merit in forest practices forester rotation to new areas to avoid negative relationships from developing or to avoid "capture" by local interests that affect enforcement. With the above background, it is time to ask the question: what is needed to make a Forest Practices Act work? My answers are outlined below in seven categories. First, the details of the forest practices rules are crucial. The rules must be technically, economically, and institutionally feasible. Rules written to satisfy political institutions without technical and economic feasibility will only satisfy the policy advocates and policy entrepreneurs. The forest resources will be worse for such rules. Second, the rule-making process will be more successful if local professionals and the regulated industry are involved. Broad direction for a forest practices act might come from higher levels of government but those closest to the action need to be participants in rule making. Third, it would be nice to remove the "controversy industry" from forest practices considerations. Association executives for environmental groups and industry benefit from fierce struggles and political maneuvers but the forest resources do not. An adversarial approach may work in a legal case, but truth loses to power in many controversial forestry issues. Fourth, there must be a "level playing field" for enforcement of rules such that no class of forest landowner or operator is more adversely impacted than others. Fifth, there must be effective education efforts about the rules and their enforcement. Such education must reach to the level of the individual forest worker and machine operator. Sixth, while the enforcement agency must do some monitoring of its own actions, a separate monitoring and assessment process would be better. The agency has strong and sometimes unknown biases that influence its objectivity over its own actions. In addition, a strong and unbiased research and extension education effort is needed to provide new knowledge and education on forest practices generally. The last area of motivation needs much more consideration in Oregon's Forest Practices Act in order not only to avoid damaging behavior but also to promote positive contributions to improved forest practices. Oregon's Forest Practices Act has been cited as progressive and effective legislation and rule administration. A number of statewide technical reviews and agency monitoring efforts support the effectiveness of the FPA. For the first twenty two years of the FPA, I would agree with that conclusion. However, as a result of more political involvement in the FPA from the composition of the Board of Forestry to legislative directives for changes, the FPA in Oregon could be on a downward spiral of increasing regulations with marginal real benefits to resource management. Options for improvements to the FPA and its administration could come from examining the motivations for improving forest operations, better education of owners and operators in forest operations, and seeking rules based on cause and effect relationships from a scientific basis rather than political pressures. The entire forestry sector is actively involved with Oregon's FPA activities and the rest of the United States and the World are watching the process unfold. Much can be learned from such a process for other states and developing countries as they consider forest practices regulations. Adams, P. W., and A. B. Hairston. 1994. Using scientific input in policy and decision making. Oregon State University Extension Circular EC 1441. Corvallis, Oregon, USA. 19 p.
Garland, J. J. 1994. Understanding roles in policy formation. Journal of Forestry (in press). Oregon Department of Forestry, State of Oregon. Various Dates. A variety of reports are available on the Oregon Forest Practice Act from State Forester, 2600 State Street, Salem, OR 97310, USA. Following is a list of the major rule changes that have occurred throughout the history of the Oregon Forest Practices Act. This list captures the major efforts resulting from legislative changes or responses to noted problems in forest practices. Most of these rule revisions entail increasing protection in riparian areas, improvement in water quality and other benefits for fish and wildlife. Initial adoption of Forest Practice Rules. Rules set specific standards for reforestation, road construction and maintenance, and streamside buffer strips. Though many rules were advisory in nature the majority were specific and enforceable. Amendments to tractor skidding and mechanical clearing rules. New rules requiring drainage systems in harvesting operations. New rules related to spillage of petroleum products. Additional protection of water sources; wetlands. Increased detail required in notification of operations. New rules requiring water quality protection related to surface mining practices. New rules and definitions related to "filling and removal" and stream channel changes. 15-day waiting requirement added to notification rule. Comprehensive revision in response to 1977 Clean Water Act, Section 208. Made rules more clear and specific regarding water quality protection and added "prior approvals" as a requirement for several practices which potentially could directly affect water quality. New rules for application of the herbicides 2,4,5-T and Silvex (rendered moot by registration cancellation in Feb., 1979). Transferred responsibility for reforestation compliance from operators to landowners. Comprehensive revision of road construction and harvesting rules in response to severe landslide problems in 1981 and 1982. Introduced concepts of "high-risk sites" and "written plans". Revisions and additions related to land-use planning Goals 5 and 17; defined wetlands, required prior approval for operations near coastal shorelands and critical wildlife habitat sites. Additional requirements related to "in-unit slides" in harvesting units. Clarified requirement to comply with written plans. Comprehensive revision to harvesting and road construction rules dealing with riparian protection in response to state agency coordination requirements of land use planning and an agreement between the Board of Forestry and the Fish and Wildlife Commission. Required specific number and size of conifer trees to be retained in riparian management areas of western Oregon. Major Amendments to Forest Practices Act through House Bill 3396. New procedures to provide copies of notifications and written plans to interested parties. New rules governing operations of Regional Forest Practice Committees. New rules specifying forest practices enforcement procedures and administration of civil penalties. Contested case procedures for civil penalties. or endangered species, sensitive bird nesting, roosting or watering, significant wetlands, or biological sites. Interim protection requirements for operations in above listed sites. New procedures for operator appeals of orders of the State Forester. New procedures for appeals of written plan approvals from public who are adversely affected. Process rules for listing sites of sensitive bird nesting, roosting or watering. Protection rules for osprey nesting and roosting sites. Process for granting exceptions to protection of resource sites. Process rules for listing sites of threatened or endangered species. Protection rules for great blue heron nesting sites. Protection rules for northern spotted owl nesting sites. Major Amendments to Forest Practices Act through Senate Bill 1125. Process and protection rules for significant wetlands. Protection rules for bald eagle nesting and roosting sites. New rule requiring compliance with statutory provisions of SB 1125, to allow enforcement with civil and criminal penalties. Enforceable statutory provisions included size and spacing of clearcuts, retention of wildlife trees and snags in clearcut units, interim stream protection measures and protection of scenic highway corridors. Definition of "single ownerships" for the purpose of determining size and spacing of clearcuts. Process rules for listing biological sites that are scientifically and ecologically significant. For more information about the Oregon Forest Practices Act, contact the Oregon Department of Forestry Public Affairs Office, 2600 State Street, Salem, Oregon 97310, telephone (503) 945-7422.